ISLAMABAD, AUG 31 (DNA) – 2018The Government of Japan has agreed to extend to the Government of Pakistan the grant assistance of the two projects “the Project for the Installation of Weather Surveillance Radar in Multan City” worth of around 2.1 billion Japanese Yen (2.3 billion Rs) and “the Project for Human Resource Development Scholarship” worth of around 330 million Japanese Yen (360 million Rs) on the 31st of August, 2018. The Notes to this effect were signed and exchanged between H.E. Mr. Takashi Kurai, Ambassador of Japan to Pakistan and H.E. Mr. Ahmad Hanif Orakzai, Additional Secretary for Economic Affairs Division, the Government of the Islamic Republic of Pakistan in the presence of H.E. Mr. Kazuyuki Nakane, State Minister for Foreign Affairs of Japan, H.E. Mr. Asad Umar, Minister for Finance, Revenue and Economic Affairs, Dr. Ghulam Rasul, Director General of Pakistan Meteorological Department and Mr. Yasuhiro Tojo, Chief Representative of JICA Pakistan Office. As this project for the Installation of Weather Surveillance Radar in Multan City, Japan places a high priority to disaster management in its development assistance for Pakistan. 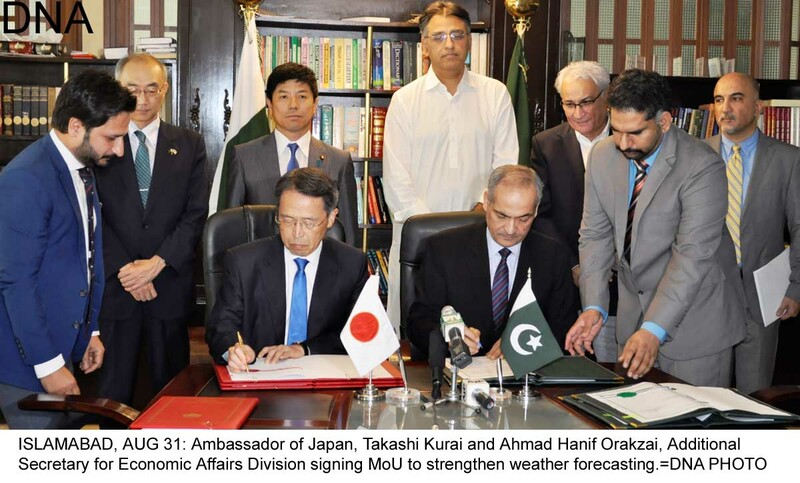 Including the project signed today, the total amount of assistance for weather forecasting of Pakistan has reached about 10 billion Japanese Yen (Rs. 10 billion). So far Japan has supported the installation of 4 weather radars in the cities of Islamabad, Karachi, Dera Ismail Khan and Rahim Yar Khan. With this project in Multan, out of 8 weather radars altogether in Pakistan, 5 will be supported by Japan and will cover 80% of the country and benefit 90% of the whole population. The weather radar network will surely contribute to further strengthening the weather forecasting capability in Pakistan and help Pakistan become more resilient to future natural disasters. With regard to “the Project for Human Resource Development Scholarship”, Japan has been providing its technical cooperation to Pakistan for human resource development since 1954 through having received more than 6,500 fellows in Japan so far. Under “the Project for Human Resource Development Scholarship”, scholarship will be offered to Pakistani officers and they will study at universities in Japan for Master’s / Doctor’s Degree, with an objective to resolve development challenges in Pakistan.